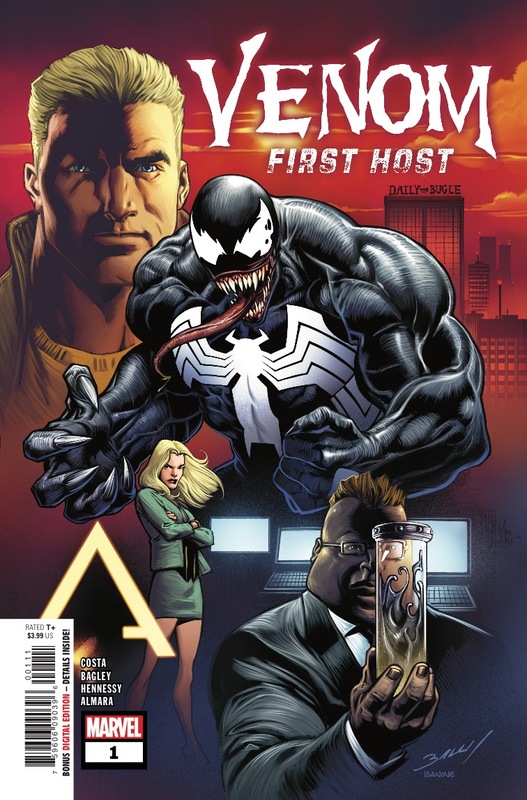 Venom: First Host #1 Review – AiPT! Learn who the first character was to ever wear the Symbiote Venom calls family. What if I told you before the Symbiote and Eddie Brock became Venom, there was a previous host? I know what you’re thinking: “It was Spider-Man, Duh!” You’re wrong. In this new miniseries by Mike Costa and Mark Bagley we learn there was another before Peter Parker took on the suit. Time for your mind to be blown. Prepare yourself for a different kind of Venom story. This is a story that takes place in the present, but also in the distant past. It’s a fleshing out of the Symbiote and a reminder it’s not just Eddie in there, but an alien with a long past. This issue opens with captions that harken to the story of the garden of Eden, which is an interesting twist on how we might view the Symbiote. It’s not clear where or even when we are, but it is clear we’re on an alien planet and the Symbiote is the serpent in this story. From there the story zooms up to the Kree/Skrull War and a certain Symbiote-wearing hero. It’s an interesting jump as it shows us Venom wasn’t the first hero to wear the suit and, in fact, the suit has had quite a history. Much of the rest of the issue is focused on Eddie which appears to be taking place right after Costa left off. He’s still interacting with Alchemax staff, has a baby fully delivered, and is generally a good guy. He does do something rather villainous, especially for him as of late, but it appears Costa is carrying this story forward without anyone needing to read Donny Cates run. It’s fun to see Venom as the head-eating hero we all know and love from the ’90s. The art by Mark Bagley is, as you’ve come to expect, great with the detailed musculature and well placed dramatic panels working well. There are more than one repetitive reaction shots that help space out time into moments (like a woman reacting to what Venom does to a criminal). There is also a slick design for an earlier version of Venom that harkens to more of a soldier look that’s quite cool. I’m a bit confused as to what Venom’s point of view is on killing these days. There was a period where he was purposefully attempting to be good about it, but clearly that is long gone here. It’s also a bit strange to have Venom fighting a deity-type character in one main series and then back to swinging around worrying about Alchemax in another. Since most of this issue lives in the realm of flashbacks it isn’t too jarring, but it’s worth noting for the “now” scenes. An interesting story that continues to reveal new layers of Venom. If you aren’t reading Venom right now you will be sorry! A strong start to a series that at Marvel that continues to flesh out Venom in new and exciting ways. Venom is back to chomping off heads!